The Minimum wage rates is a minimum wage law poster by the Minnesota Department Of Labor & Industry. This is a mandatory posting for all employers in Minnesota, and businesses who fail to comply may be subject to fines or sanctions. This poster must be posted in a conspicuous place where all employees will see it. This poster describes the minimum Wage Law for employees in various types of industries as well as when the Minimum Wage will go up and the rights of employees. This poster also contains the contact information necessary to learn more about the Minimum Wage. It appears you don't have a PDF plugin for this browser. 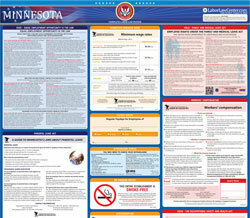 Please see the link below to download minnesota-minwage-poster-0.pdf. participate in an activity the employee knows is a violation of law. View complete wage-rate information atwww.dli.mn.gov/business/employment-practices/minimum-wage-minnesota.